Can you tell I cranked this out in 5 minutes? Welcome Guardians! Welcome to the Open Forum, which is hosted by Kotaku's reader-run blog, TAY. This is a place to talk about life, video games, or anything else, so feel free to hop in and join in the topic discussion, or comment about anything. Then, when you're done, feel free to peruse the articles on TAY and TAYClassic. Is this your first time on TAY or the Open Forum? Then check out this handy TAYTorial! Also, don't forget the new IRC Chatroom where they ヽ༼ຈل͜ຈ༽ﾉ raise your magic lenses ヽ༼ຈل͜ຈ༽ﾉ ! Want your TAY reviews to explode like a cherry bomb? Get the TAY review materials here. Finally head toward the DirecTAYry if you're looking for your own rag tag team of misfits to join in your adventures! Hey there, square! It's another TuesTAY which means I'm hosting your unofficial tay classic Open Forum. Today I wanted to talk about Crossovers. Do you like them? Do you hate them? 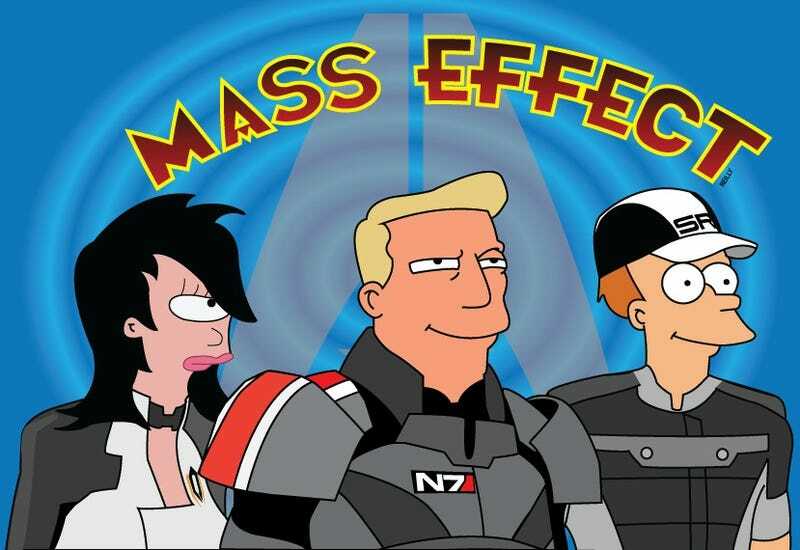 Do you wish a Mass Effect X Futurama was a real thing? Feel free to talk about this or anything else in the comments!